Press Release | Procos S.p.A.
Cameri, Italy: – Respected Italian contract manufacturer (CMO) Procos has gone ‘live’ with its new website, providing a transformed online look for the company as well as cutting-edge interactive ways to explore its products and services. The new web presence at www.procos.it makes extensive use of high-quality video, audio and graphics, xml, Flash animation and other leading-edge web technologies to present the full range of Procos development and custom synthesis services in APIs and cGMP advanced intermediates for the pharmaceutical industry. 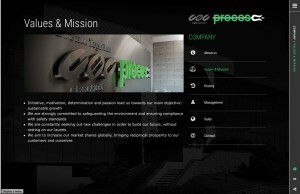 The distinctive template features Procos ‘house colors’ of white and green on black backgrounds, uncluttered pages, prominent side bar menus, and extensive use of icons. It allows browsers to explore company profile, values, history, management structure, sales network and direct contact channels. Procos’ 70- year history is conveyed in a striking timeline slide show of images, beginning in 1945 when two young chemical researchers set up a new company in Novara, through to the imminent opening of the new R10 manufacturing and research facility at Cameri. The new home page hosts an HD video showreel that provides a rapid tour of Procos as it is today. Using the ‘Explore’ feature provides browsers with alternative routes into Procos company information, products, capabilities and compliance standards. The mobile friendly site design is also compatible with smartphones and tablets. The site hosts direct download product brochures and will also feature and well as mini video reels that present different Procos products and services. The new map feature allows customers a one-click way to find the Procos sales outlet nearest to them. Procos S.p.A. is an Italian Contract Research and Manufacturing Organization (CRO, CMO) that specializes in development, scale-up and production of APIs and cGMP advanced intermediates for the pharmaceutical industry. Procos is an important member of the international CBC Group, headquartered in Japan. This network provides Procos with global reach, reinforced with subsidiary sales offices in the USA, Slovakia, Germany and India. Over seven decades, Procos has built up a comprehensive range of technologies and capabilities to provide high quality products and services that have been widely accepted in worldwide pharmaceutical markets. It continuously develops and adds unique generic APIs and key intermediates to its product portfolio. Procos’ two core business sectors are the development and supply of APIs and GMP advanced intermediates along with contract manufacturing services. Procos manufactures more than 30 products, mostly under uniquely designed synthetic methods and under strict regulatory compliance management. In contract manufacturing, Procos provides related services for the pharmaceutical industry acting as a CRO/CMO for custom synthesis on exclusive base, supporting customer from early clinical stage up to full -scale commercial production. Development services include IP analysis expertise and effective patent challenge skills. Innovation is a driving force of Procos activity. go ask alice pdf The company’s products are based on patented technologies and cost-effective processes. Procos chemistry expertise is focused on the most complex organic reactions, including organo-metallic catalysis, multi-catalytic hydrogenation, Enantioselective and hazardous chemistry. Click on Procos rolls out new look website for other information. Click on Procos to contact the company directly.